The real website, however will remain on the main domain, i.e. thecustomizewindows.com – we are not moving WordPress to admin.thecustomizewindows.com, that is quite easy and hardly requires 15 minutes if you follow our another guide for cleaning WordPress Database. Why We Need to Move WordPress Administration to a Different Server or Domain? WordPress, unless you are working from MySQL Table level, moving can be proved to be dangerous. The performance of WordPress Administration is quite pathetic and demands continuous computing resource – whether you are sleeping or the website is completely sleeping, it really does not matter, the increased demand on the backend can make the front-end to throw errors. Instead of installing Heartbeat-Pacemaker for High Availability, if we can manage the backend; i.e. the WordPress Administration to move, it will require less computing power in total. Plus, the calculations of performance by tools like New Relic, will be more precise. It is needless to state that, the security will be increased. It is obvious that your database is on separate server or you are using database as a service. The reason we included this guide under Cloud Computing, not only under WordPress is solely due to the fact – these kind of risky steps are not possible with traditional system. Simply the DNS can fail. Failure of DNS Server is quite common than we usually think. Obviously, you can test this method on localhost – traditional system will definitely work, what we are saying is of quite precision – traditional can fail as we are basically doubling the source which can fail. With very less pageviews, this will not an issue. Higher the pageviews and/or crawl rate, more these will show up. Definitely, you can use another server for wp-includes, but we guess it will add more complexity and yield less advantage. Unfortunately our hack failed because we never considered a big part – the Ajax calls. We must modify by using some WordPress filters. Internet Explorer, however creates a big issue after login. The easiest way to get rid of this is not to use Internet Explorer to login. Windozzz and Internet Explorer will not create any issue for the non-logged in users. Yes, there is ugly .htaccess way or complex .ini settings to redirect from the backend, but we think, this is probably better. You have to manually update. Do not click the automatic update button with this setup. This Article Has Been Shared 7435 Times! Repairing WordPress Database is easy by using Cloud Database Server like from The Rackspace Cloud which provides MySQL database server with PHPmyAdmin software. Using https URL of Rackspace Cloud Files for WordPress needs some extra steps for more secured delivery of Static Content of your SSL enabled WordPress site. Making WordPress to Load Faster on Rackspace Cloud Sites needs WP Super Cache,CDN Sync Tool, HyperDB, .htaccess tricks and tweaks to make buggy plugins working. WordPress Lost Post Recovery Options Are Not Less in Number on Cloud, Even Without Backup Failure. If Your FTP Server is Running, Data Can Be Recovered. WebSocket is a Protocol which has PHP library for serving real-time messages between clients and server which opens the possibility to use with WordPress. 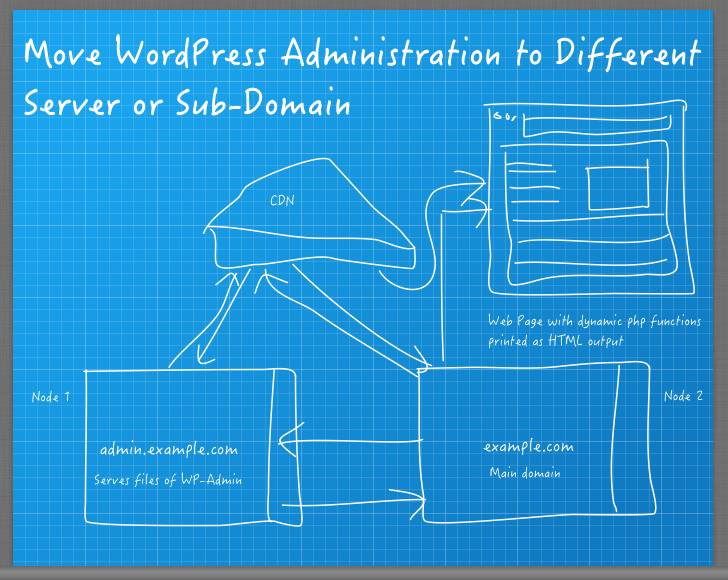 Cite this article as: Abhishek Ghosh, "Move WordPress Administration to Different Server or Sub-Domain," in The Customize Windows, November 24, 2013, April 21, 2019, https://thecustomizewindows.com/2013/11/move-wordpress-administration-to-different-server-or-sub-domain/.